You can capture still images of the scenes you like in the recorded videos. Tap on the desired video. Tap pause at the desired scene during playback. After pausing the video, you can fine-tune the point to capture by tapping forward slow-motion and reverse slow-motion . Still images are captured with a size of 1920×1080. 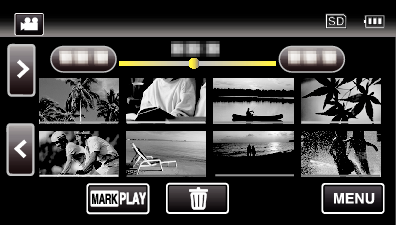 Make a selection at “IMAGE CAPTURE TYPE” in the “PLAYBACK SETTING” menu. If “9 CONTINUOUS SHOTS” or “9 MULTI” is selected toward the end of the video being played back, the numbers of captured still images may be less than 9. 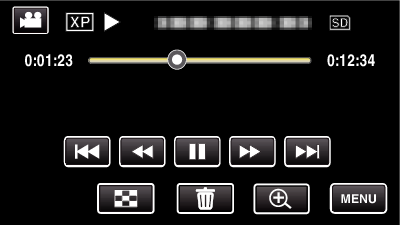 Make a selection at “CAPTURE INTERVAL” in the “PLAYBACK SETTING” menu.